On July 4th, the Reuters website carried an article based on a joint interview with Chinese Ambassador Liu Xiaoming on June 9th by the Reuters' global news editor Alessandra Galloni, business and news investigation editor Simon Robinson, Breakingviews' editor John Foley, European Politics and Economics editor Mark John and Asia Top News editor Mike Collett-White. The article is entitled "Ahead of key court ruling, Beijing in propaganda overdrive". The following is the transcript of the interview. Alessandra Galloni: Maybe we could start with if you could tell us where we are now in terms of what your position is vis-a-vis the ruling that is about to happen? Ambassador Liu: Our position had been reaffirmed by the statement just issued by the Ministry of Foreign Affairs regarding this arbitration initiated by the Philippines: China will not participate in the arbitration. From day one, China strongly opposed this arbitration case. We believe it is illegal for a tribunal to handle this case. First of all, the Philippine's arbitration case is against UNCLOS, because sovereignty and territorial disputes are not under the jurisdiction of UNCLOS. Secondly, Philippine's case is also related to maritime delimitation. China, like 30 other countries, made a declaration in 2006, that China will not take part in third party arbitration when it comes to maritime delimitation. UK is one of the 30 countries. UNCLOS provides that sovereign countries have their sovereign right to make these declarations on optional exceptions. Thirdly, China has always been calling for bilateral consultation and negotiations with neighboring countries, including the Philippines, when it comes to maritime disputes. And a series of documents can show that the Philippines agrees to this practice. There are a series of statements between China and the Philippines on how to resolve disputes. It was until 2013 when they submitted this arbitration case. In our view, the Philippines have turned their back on their promise and that is against international practice. Once agreed, you have to follow your commitment. It is also part of the Declaration on the Conduct of Parties in the South China Sea (DOC) reached by China and the ASEAN countries that disputes should be resolved by peaceful means through friendly consultations and negotiations by sovereign states directly concerned. The Philippines agreed to it but turned their back on it. Fourthly, this arbitration, according to UNCLOS, is only a supplementary means to resolve disputes. Bilateral channel is regarded as the main means to resolve a dispute between countries. The Philippines had never come to China to talk about this arbitration. And China and the Philippines had never had serious negotiations on this subject back then. That means the main channel had never been used, to say nothing about being exhausted before the Philippines went to arbitration. That is against the spirit of UNCLOS. So we have many reasons to oppose this arbitration case. We also hold the position that if this arbitration goes through, it will set a very bad example. That concern has been expressed not only by Chinese legal experts, but also by British and Dutch experts on the Law of the Sea. China's position has been supported and appreciated by many countries and international organizations, many legal experts, not only in China, in Asia, but also in Europe and America. That is our basic position. Some people try to label China as not respecting international law if we reject this arbitration. But that is totally wrong. What China is doing is exactly safeguarding the authority and seriousness of international law, safeguarding the letter and spirit of UNCLOS. We do not know and do not care when this arbitration decision will be made. No matter what decision this tribunal is going to make, we think it is totally wrong. It has no impact on China and China's sovereignty over these islands and reefs will not be bound by it. It will set a serious, wrong, and bad example. We will not fight in the court, but we will certainly fight for our sovereignty. 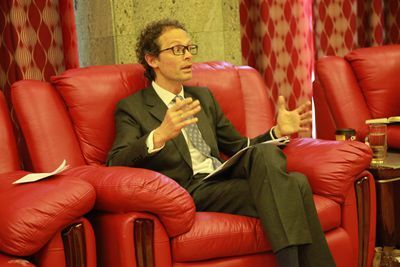 Alessandra Galloni: You mention that there are countries supporting China's position. How many countries are on your side on this matter? Ambassador Liu: There are many. Some countries issue statements. During China-Russia-India Foreign Ministers Meeting, a joint statement was published, endorsing China's position. The Shanghai Cooperation Organization supported China's position. Some ASEAN countries, African countries, European countries, dozens of them – quite a few countries appreciate China's position. Mike Collett-White: When you talk about support for China's position, you mean the position that this arbitration process is not legitimate? Ambassador Liu: In different countries, they have focus on different parts of this case. But on the whole, they appreciate and support China's position that this should be resolved through bilateral channels rather than put up for arbitration by the tribunal. Because according to international law, that tribunal cannot handle that case without the consent of both sides of the dispute. The Philippines unilaterally submitted this case to the tribunal. They never consulted with China before they submitted it to the so-called tribunal. They did it at our surprise. They did it at the expense of China's national interests. It is a serious damage to the national interest of China. So China is fighting for its sovereignty and its national interests. What is more, we are fighting for justice. In terms of essence and procedure, it is wrong for the tribunal to handle this case. Mike Collett-White: If the diplomatic machinery is used and does not produce agreement, what is the correct mechanism for reaching consensus? Ambassador Liu: If you have not tried the diplomatic negotiations, how can you prejudge the outcome? You know, we have differences with several neighboring countries. Take for example, China has 14 neighbors. We reached treaty and agreements on the border arrangements with 12 of them. That means diplomatic negotiations are effective, and we can resolve disputes through bilateral negotiations. China has disputes with Vietnam, yet through friendly and time-consuming process of negotiation, we reached an agreement with Vietnam on the Beibu Gulf, with regard to maritime delimitation and how to manage disputes. China has been working for peaceful settlement of dispute. We understand these are difficult issues, as different countries have different claims. But first of all, we should make it clear that it is not that China is claiming these islands now; China was the very first country to name the islands, to develop the islands and to manage the islands. Before 1970s, of all the neighboring countries, no one had challenged China's sovereignty over those islands. Only when oil and resources were found did they start to scramble to claim rights. Up to now, 42 islands and reefs had been illegally occupied by Vietnam, the Philippines, and Malaysia. We are not going to war with these countries. We do not want to have a fight with them, but we stand firm with regard to China's sovereignty over these islands. We believe what they are doing is illegal occupation of the islands. And we propose that we can shelve the disputes. We can have negotiations to try to find a solution as to how to handle the disputes. At the same time, we can have joint development. So our position is: shelving disputes and common development. So that has been our position all along and is still our position. Ambassador Liu: Yes, of course. You know, we are open to negotiations. The Philippines, they can put forward their proposals. And we can have our proposals and we'll meet half way. Any negotiation is a process of compromise. And the statement issued by the Ministry of Foreign Ministry yesterday is still calling for negotiations with the Philippines. Now they have elected a new government. 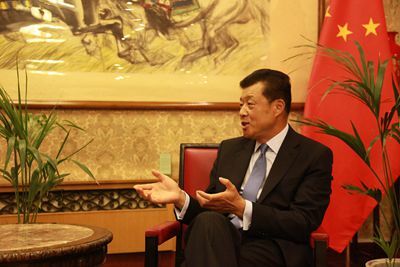 We do hope that they will change their course, return to the negotiation table, return to the bilateral talks with China. The door is always open. Alessandra Galloni: Has there been any indication from the new Philippine government that they would like to return to the table? Ambassador Liu: We do not have specifics with regard to their response regarding the arbitration case, but we read some positive signal from the Philippine government that they want to have a good relation with China; they still believe good relation between China and the Philippines is in the Philippines' interest and they would like to have friendly discussions with us, but so far we haven't heard anything about their official position on the arbitration, or any change of their position on the arbitration case. Simon Robinson: There are very strong arguments why China would have the claim to those islands and why the process that's going through in The Hague is not right. Why do many parts of the world still see China as the "bad player" in this? Ambassador Liu: When you say "many", I'm not so sure about "many". I've been very straight forward in my Q&A at IISS not long ago. I think before America's so-called 'rebalancing in Asia Pacific', the South China Sea was very quiet, very peaceful. China was talking to the neighboring countries. We had a Declaration of Conduct. And the Philippines was talking to us. Once the Americans came in, so-called "rebalancing", things changed dramatically. The Vietnamese changed their position with regard to talking to China. The Philippines changed their position. I think the American move in the Asia Pacific emboldened those countries to change the traditional channel of negotiation with China. And they probably believe that they have the Americans behind them, and they can get a better deal with China. So I'm very suspicious of American motives. America openly supports the Philippines in this case. And they got Japan. America is the superpower. America has some allies. I don't know what kind of influence they try to exert on their allies. So we've heard this chorus of countries, but I don't think there are many. There are some. They might be the minority but they can make a big noise. I heard that the G7 made a noise, but the G7 is not the world. I think the G7 should realize their influence on world affairs is history or yesterday's story. But they still believe they are the most influential power in today's world. We are strongly opposed to the statement by the G7 with regard to the South China Sea issue, with regard to the tribunal case. We don't think they are on the right side of the arguments. John Foley:Speaking of the large developing countries, India recently said it's been approaching Vietnam to supply missiles that it makes. Now this is a tiny, tiny incremental step in the bigger picture that we are talking about here, but it is a step nonetheless. And Indian defense officials, they are not on the record, but they made no secret of the fact that this is with a view to trying to dilute, perhaps, China's influence over disputed waters. I don't want to focus just on that but basically it's an example of how other countries are sort of getting involved. You might say it's unwelcome but it's becoming not just traditional countries that have been locked in the dispute. It seems to be spreading. Is that something that you are concerned about? Ambassador Liu: Not to my concern. I think for the Vietnamese Government and Party, to have a good relation with China is in the national interest of Vietnam. Their President, their Party Secretary have visited China very often. It's always China's position to have a good neighborhood policy. No foreign relationship is more important than the relationship with your neighbors. That applies to any country. So we attach great importance to our relations with Vietnam. You know relationship goes up and down, back and forth. During Vietnam's war against the Americans, China and Vietnam were allies. We fought shoulder to shoulder. And after the war, China and Vietnam fought each other. It's not because of us. I think the Vietnamese made a wrong judgment. They were on the wrong side of history. Now I think people reflect on what was happening in the past and realize what are in the best interest of the two countries. We are both developing countries. I think we have more in common. The commonality between China and Vietnam is greater than the differences between us. 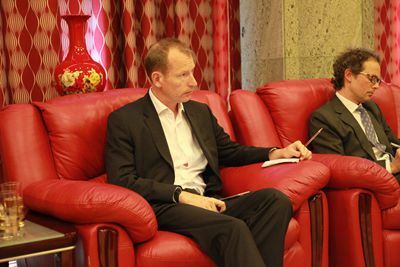 I'm confident about the relation between China and Vietnam. We also have a good relationship with India. When Prime Minister Modi came to office, the relationship has grown stronger and stronger. President Xi Jinping visited India and Prime Minister Modi also visited China. Prime Minister Modi even took our President to his hometown and, you know, that's a very special arrangement. India is one of the largest neighbors of China. We have very good cooperation in the BRICS. India and China are really the two largest developing countries. There is more common ground, more common interests that bind our two countries together than the differences that divide us. To answer your question about missiles, we do hope that countries in the region will do more positive things – things that are conducive to stability, prosperity – rather than the opposite. Mark John:France has proposed to European countries to take part in joint South China Sea patrol. Is China open to that? Ambassador Liu: I would say now the situation in the South China Sea is calm and peaceful. There is no reason for military involvement from outside power at all. Americans said they are there for so-called safeguarding freedom of navigation. We think this is a false argument. As I said, before their "rebalancing", the South China Sea was very quiet, very peaceful, and very stable. One of China's long-term position with regard to the dispute of the South China Sea is what we call "dual-track approach". One track is bilateral negotiations. We realize there is a dispute. We engage with Vietnam, the Philippines, Malaysia – countries that we have a dispute with bilaterally. The other track is China and the ASEAN countries – 10 countries – working together to maintain peace and stability in the South China Sea. As a result of this work, we have the Declaration of Conduct to guide how we should behave, how to operate in the South China Sea. Three years ago, we started the process of working on a "code of conduct". The Declaration sets the principle. And the "code of conduct" will be more detailed guidance about how countries should behave, how they should work together; when it comes to a difficulty, a problem, a contradiction, how we should work together, coordinate, and try to find a solution. So we believe this region – because of China's proposal, because of the collaboration between China and ASEAN – it has been peaceful and quiet. Yet Americans now send more reconnaissance planes and warships. What they are doing is not for safeguarding free navigation. They are there to challenge China's sovereignty over the islands and reefs. And they make a dangerous provocation. China has a legitimate right to check what they are doing. The South China Sea is very wide. There is a lot of space and area for American warships and planes to go through. Yet they are not interested in the open sea. They are more interested in areas close to China's islands and reefs. What are their intentions? If they do not try to provoke, I think the area and the region will be very peaceful, very stable. So there is no reason for foreign fleet to go to the South China Sea to patrol, to protect the free flights, the freedom of navigation. So far we have not heard a single case that a merchandise vessel or whatever run into problem, or was restricted with regard to their freedom of navigation. Not at all. The Lloyds, a very prestigious insurance company, never regards the South China Sea as a risky area. If they found it risky, they would raise the insurance premium. They think the risk is very low and there is no reason at all for them to give any warning to their ship owners. So I think this issue is really of Americans' making. They want to make an excuse so that they can have more military presence. Mark John: And can you reassure the Americans therefore that there aren't any plans by China to reclaim and build on the Scarborough Shoal? Ambassador Liu: Why should we give Americans reassurance of that? I think there is a misperception of why China is doing this. First you have to realize that is Chinese territory. China has sovereignty on the territory. Likewise, foreign countries cannot tell the British government what to do, or not to do, on your territory or on the islands that belong to you. Before the Americans made up this things, Vietnam, the Philippines, Malaysia – countries that have claims on the islands that they illegally occupied – have had constructions long since. Yet the Americans turned a blind eye to this. The Philippines and Vietnam all have deployed military forces on these islands. It is not China who did all this construction. China is a late comer. Some people say that China has done it on such a big scale, so that's why they are concerned about this. China is a large country and our islands are bigger. Big or small is not the base for an argument, but whether it is right or wrong. First of all, if construction on the island is wrong, why do Americans and Europeans turn a blind eye to the Philippines and Vietnam? Secondly, the Philippines and Vietnam are doing all these things on illegally occupied territories, whereas China is undertaking constructions on our own islands, not illegally occupied islands, and also mostly for civilian purposes. China is not doing this construction for our own interest. We are also providing public service. We build lighthouses, rescue centre, and maintenance service center. I read some reports, in fact by you, Reuters, that some ship owners from Singapore, Southeast Asia, give us a big hand for these constructions. They said that because of the facilities built by China, when it comes to rescue efforts, it saves more time and increases chances of survival. So it has been welcomed by ship owners and by neighbouring countries. So we are doing the right thing. Simon Robinson: Why does Washington want to challenge China's sovereignty in the South China Sea? Ambassador Liu: They want to find an excuse to have their strong military presence in the South China Sea and in the Asia Pacific. If it is so quiet, what is the reason for them to be there? Alessandra Galloni: Going back to your lighthouses, and this mention of the rescue efforts that have helped other countries, one of the things China has said is that this reclaiming, building lighthouses and other initiatives, are to the benefit also of the international community. Could you explain that a little bit better? You mentioned certain rescue efforts which take less time. What else exactly? Ambassador Liu: There are many. I have a laundry list of all the services available, such as water supply, lighthouse, environmental reservation, and scientific research. Alessandra Galloni: And this would benefit specifically the international community? Ambassador Liu: Yes, of course. And we are open also. We may have some joint research in the future with British scientists with regard to marine conservation. When asked if there is a possibility for foreign journalists to land on some of the reefs and islands, our foreign minister responded by saying when conditions are ripe, we certainly would welcome foreign journalists. Alessandra Galloni: Because there is the sense that the inability of doing that, not letting journalists in, there is something to hide. Ambassador Liu: We want to make your trip more comfortable. Alessandra Galloni: We are journalists. We don't need comfort. 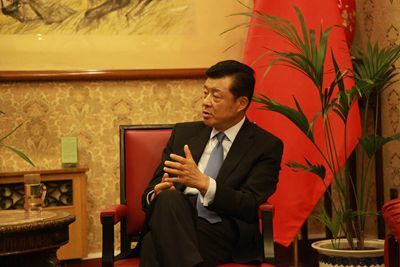 Ambassador Liu: China is a very hospitable country. I hope you will not be faced with the situation as in Iraq, Syria. Alessandra Galloni: So it is for our protection. Ambassador Liu: For your safety. I just received a delegation from Chinese military. They are here for consultation with British military. I asked them when they would be ready to receive foreign journalists. We really would like to have some British journalists, especially for those who are open-minded, not biased against China, doing good reporting. I would include a reporter from Reuters in the pool. He said in due course, we will get journalists in. But now construction is still going on. I don't think your journalists will be happy when there are cranes over their head. Alessandra Galloni: The decision is a military one. I thought they are civilian projects. Why is it up to the military to decide? Ambassador Liu: The majority of them are civilian. But there are some military facilities. As for the question why China is building military facilities, you should ask the Americans. They made us feel threatened. It is not we who are threatening the Americans. They sent their warships and military aircrafts so close to us. We need to do something to protect ourselves. John Foley: One of the things that always puzzled me when I lived in China, this may sound very naïve, but I am just trying to think about this with no cultural baggage. The things that give China the legitimacy as a growing, maybe adolescent superpower, or future superpower, they are things like a huge population, rising wages, rising standards of university education and a very globalized approach to things like trade and finance. They are not land borders. I've always wondered given that China has so much legitimacy through showing other countries how to overcome traditional restrictions and borders, why do you care so much about some uninhabited islands when really what makes China a superpower is things that have nothing to do with borders and sea? Ambassador Liu: I think that is in China's DNA. China has been suffering badly in the hands of foreign powers in the past hundred years. 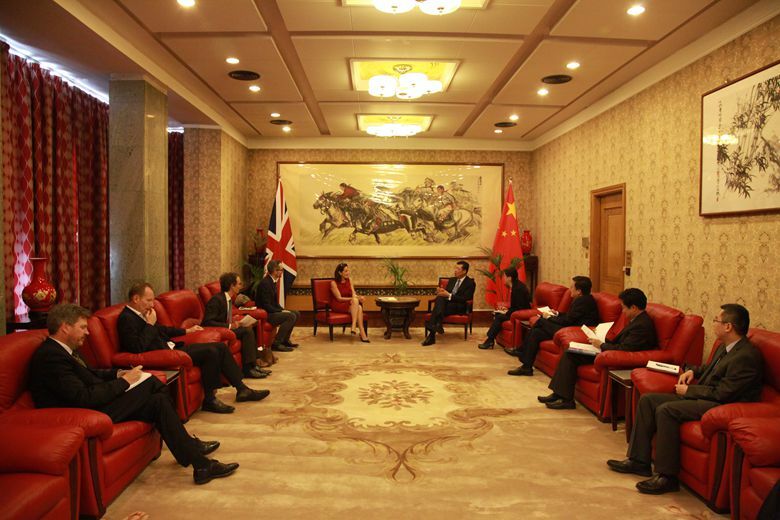 The other day I was with a Chinese delegation touring British parliament. And there was a senior official who asked me whether that was the room where the British parliament debated about launching the opium war against China. I said "exactly". The Chinese people have a long memory of what we suffered, when many unequal treaties were imposed on China. I often share one story with visitors from China and with my staff. This Embassy is the very first Chinese mission overseas. While we should feel proud of the tradition, we are not proud of the reason why this has become China's very first mission abroad. That's a result of the Treaty of Yantai (a city in Shandong Province) imposed by the British Empire. A translator of the British legation in China was killed in a fight with local people in Yunnan after he had shot dead a local resident. The British Empire took advantage of this incident and imposed this Treaty of Yantai on China. It contains three basic articles: one, pay compensation of 200,000 taels of silver; two, open up four more ports along the Yangtze River; three, and the most humiliating, send a minister to Britain to make apology, face to face, to Queen Victoria. China was weak then after the Opium War, could do nothing but pay the money, open up the ports, and send this poor minister, my very first predecessor to Britain. But the Emperor realized it was a very humiliating mission, and that since there were many ministers in China from many countries, from Britain, France, Italy, and many other European countries, he decided to turn this minister with one mission of apology to a resident minister in order to save face. So the first resident Chinese minister was sent overseas. His mission was to make apology. The first letter presented by a Chinese resident minister to a foreign head of state was not the letter of his credential but a letter of apology. This was a humiliating past. It's always remembered. John Foley:Do you think the young people in China, who have Taobao, Weixin and holidays in Thailand, do you think they would care about this, what the government talks about all the time? Ambassador Liu: I think the majority do. 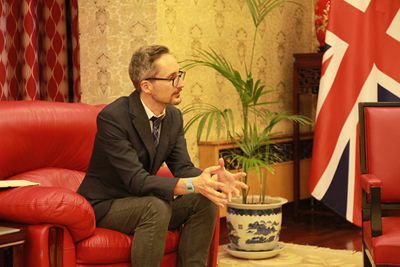 From time to time, I receive invitations to talk to the students in Beida (Beijng University) and other universities, and to Chinese students in many universities here in the UK. Many of them see me as a hero because of my interview on BBC Newsnight with Jeremy Paxman, defending China's position on Japanese Prime Minister Abe's visit to the war shrine, on Diaoyudao and other issues. And I was told that I have millions of fans in universities and colleges. So there is a high enthusiasm and patriotism among young people. They care about what China should be today and what China will be in the future. We have lost so many territories, so people care about the territory we have. In China, there's an old saying, "one inch of land is worth the same amount in gold". We are not asking for any territory that does not belong to us, but we'll defend every inch of our land at any cost. I hope that answers your question. Alessandra Galloni: Thank you, Ambassador Liu, for giving the interview. 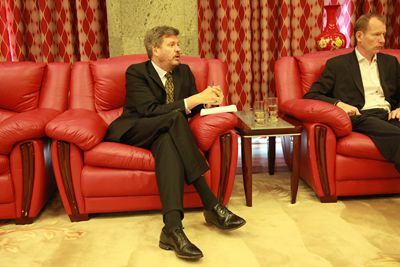 Ambassador Liu: I look forward to meeting you again.